Here's an interesting map of where mega-churches are located in the U.S. There are 1,300 churches with at least 2,000 in weekly attendance. I was struck by how similar the maps look. I would have expected more regional differences. I think there's at least one significant regional difference there. The concentration of megachurches, or lack thereof, in New England, in comparison with the population density in the northeastern corridor, is striking (to me). I have no objective measurement, but I would have expected to see just that - a relative lack of evangelical megachurch-style attendance in an area that is heavily populated by liberals. The similarities are interesting with the noteworthy exception of New England. We moved here several years ago from Arizona to plant a church. This is truly an interesting place. I think that you're right about New England... I noticed the same thing when I moved out here, though that was 10 years ago. 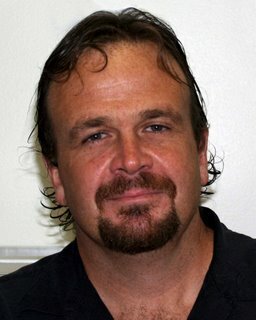 I wonder if it's because of just having fewer Christians or a bias toward smaller churches? I find it amazing that with over 350,000 churches in the USa we are so focused on those 1300 churches. I am not a statistian but wouldn't be more of an anomally than the expected norm? I think that even if the proportion of church-goers was lower in areas of major population density you would still see the same relative density of mega-churches. After all, only a major metrolpolitan area could support a mega-chruch anyway. I think a better measurement would be the density of small churches. I'm guessing you would find a higher density in flyover country as even the proportionately fewer Christians in major metropolitan areas are drawn to the mega-chruches for a variety of reasons. Oh well, its just a thought. I think you're right, Fred... the main message from these maps is that you need big populations to support a big church. It would be interesting to look at the counter examples--big churches in small towns. Hey Brad, I was wondering where you got your maps from, i'm doing further study into this, it would help lots! thanks! There's a link for the church graphic in the post. 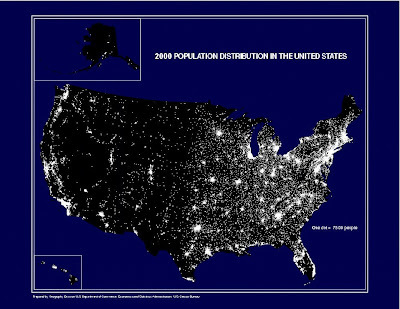 The "at-night" graphic is from the census bureau.